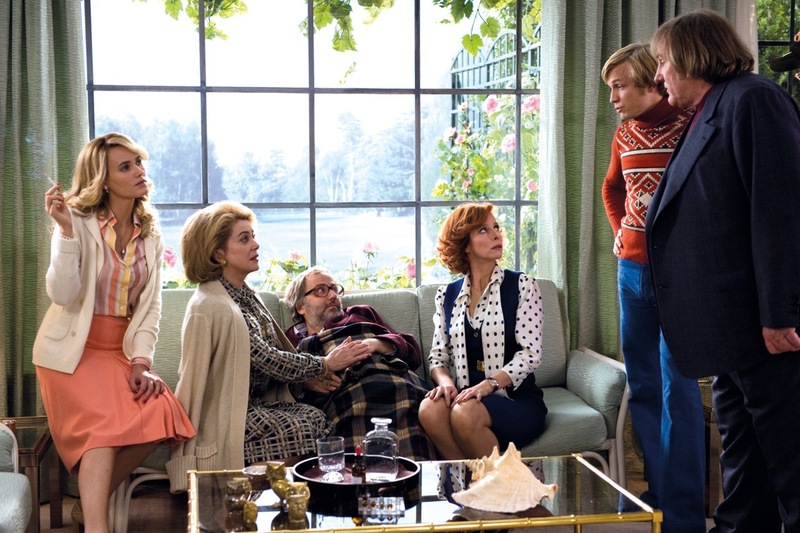 Starring: Catherine Denueve, Gerard Depardieu, Fabrice Luchini, Jérémie Rénier, Karin Viard, Judith Godrèche, Sergi López. French performers Catherine Deneuve and Gerard Depardieu are two household names in their native France but will also be familiar with English language filmgoers. Basically, they’ve been around and have delivered an incalculable amount of great performances throughout their careers. This is a film that brings them both together (although not for the first time) and serves as a reminder of how skilful and commanding they are on screen. 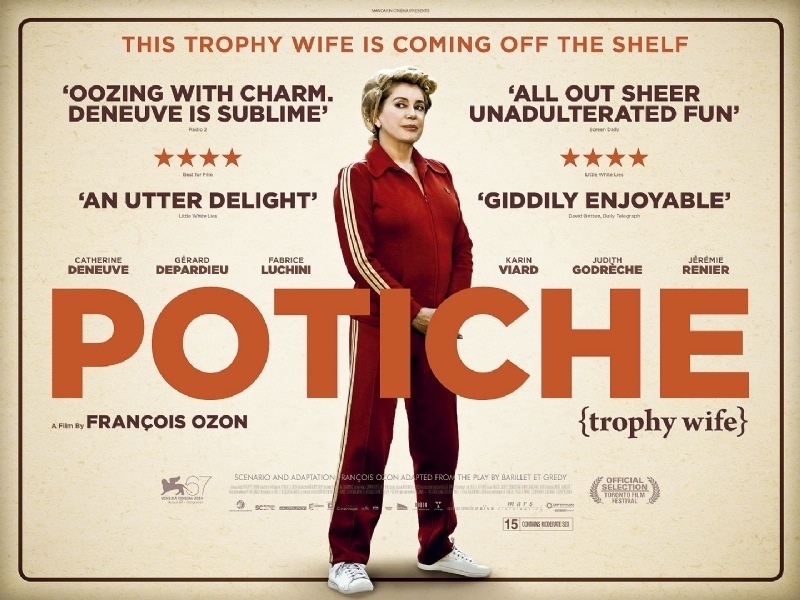 Suzanne Pujol (Catherine Denueve) is a “Potiche” – a decorative, trophy wife – who runs a household, while her husband Robert (Fabrice Luchini) runs the family umbrella factory and philanders with his secretary. A workers strike breaks out which leads to Robert having a heart attack and while he recuperates, Suzanne reluctantly takes control of the family business with her two adult children. However, Suzanne is more shrewd and clever than given credit for and she manages to regain the trust of the workers and turn the fortunes of the business around while steadily gaining respect from numerous corners of society including Maurice Babin (Gerard Depardieu), the influential Mayor. It takes a little time to work up to “Potiche” as it’s very dialogue driven. So much so, that it’s quite difficult to keep up with the subtitles and it’s constant stream of verbal exchanges. However, it’s confidently handled and when it does get going it throws in many facets of an individuals life and the complexities and challenges that life throws at us all. Where it’s strengths lie is in it’s perfectly pitched commentary on the struggle that women faced throughout the 1970’s in order to achieve the same equality as men. Denueve’s Suzanne Pujol is the perfect embodiment of a woman hanging up her apron and reclaiming her respect and dignity. It also shows a balance between the strength and vulnerability involved in such a time; on the surface, Suzanne is seen as weak yet she grows in confidence and even considers divorcing her husband. Meanwhile, her daughter Joëlle (Judith Godrèche) is seen as strong and independent yet ultimately can’t bear to be alone. One of the few decent male figures is Suzanne’s son, Laurent (Jérémie Rénier). He’s a prominent supporting character and even though he’s male and serves as his mothers rock, he seems to carry a certain femininity. This is one of the many clever little devices that provide this film with an astute commentary of the politics and the cognitive shift between the sexes during the 1970’s. The only issue I had was the pacing; despite the wonderful story, quirky humour and solid performances, it fails to completely hold your attention. This is a small gripe but still one that I couldn’t ignore. If it delivered itself with a bit more urgency, then this would have been top class. A subtly handled little dramatic comedy that manages to incorporate many facets of life and has a sumptuous rendering of the 70’s era. It could have been tighter, but it’s still a lot of fun. This entry was posted on June 16, 2013 at 9:40 am and is filed under Comedy, Drama, Foreign Language with tags 2010. You can follow any responses to this entry through the RSS 2.0 feed. You can leave a response, or trackback from your own site. Excellent post, I will definitely watch this as I’m a huge fan of Catherine Deneuve. Cheers Vinnie. If I remember correctly, you’d recently visited an Ozon/ Denueve movie and I mentioned this one? That’s me just getting round to finishing a write-up. It’s worth a watch, man. Nice review. As a fan of French cinema this is been on my watchlist for sometime. Really glad to see your take on it. Cheers Bro. It’s good stuff. Could have been better if it corrected it’s pace but other than that I really enjoyed it. I did consider rating it slightly higher but 3.5 is still a good rating. First I have heard of this one Mark. Is there a scene where Depardieu urinates on an airlines stewardess? I liked it. Deneuve and Depardieu are two French souffles, they rise to the occasion. But the French still don’t want to seriously examine women’s role in their society. How else to explain the Snow White like treatment of Denueve’s character. They still want women to be consorts and mistresses even in regards to their Prime Ministers. Denueve is quite something, taking good roles into her 70’s, rare for actresses. Depardieu is a mere shadow, at 3 times the size, of himself. Hope they both have good roles ahead. Two french souffles? LOL. Nicely put Ray. I liked this one too, and you make a great point on the French outlook. Her emergence and rise was rather fairy-tale like. Loved the humour in it, though, and it managed a nice balance with some serious issues. The pace and slight over-length were an issue for me but overall a good little flick. You know what I mean about French “attitudes” towards women? Francois Hollande leaves the mother of his 4 children, not his wife, shortly after being made President and takes up with a TV journalist. That would not fly in the U.S. Viva la Hillary Clinton! It’s worth checking out Ruth. Denueve is fantastic (and, yes, beautiful). It’s a very good role for her and she seems to know it. There is plenty to enjoy with this one. Cheers Garrett. It could have been a bit better but it’s still a charming little film. This sounds great Mark, never heard of it but I’ll give it a shot. I’m always up for a smart comedy. It will definitely appeal more to some than others Chris. I found some faults with it but I still liked it. I always find French cinema quite refreshing and this done just the job. LOL. I couldn’t agree more on all three points mucker. Thanks for pointing this one out…it flew under my radar and I must try to check it out. Curious to see how seriously Depardieu took his role. Interesting that the two pantheon actors of their generation, himself and DeNiro, basically became hacks at around the same time. Bobby has been climbing out of strict paycheck roles for the last few years…would be nice to see Gerald follow suit. I think this one has passed a lot of people by but it’s worth some attention. Yeah, it is great to see Bobby get back on track but I have to admit that I’ve seen Depardieu in a couple of good french crime drama’s. Namely, “Mesrine” and “36”. Two that are definitely worth checking out. Great review mate. I think I remember Orange using this as part of their marketing during the adverts at the cinema a while back. I wasn’t sure if it was a real film at the time. Turns out it was! Sounds pretty interesting too. Cheers Chris! It is indeed a real film. A pretty good one too. Can’t say I’ve ever seen these Orange adverts though. Seems like a strange film to use as a marketing deal. Yeah it was very odd indeed, I’m sure it was this film though. They added fake subtitles to it that were all about phones and the like. I was fortunate to watch this one last year during the Miami International Film Festival. I remember enjoying the chemistry between the two leads. Good review. Good point about the changing sexual politics of the 70s. One of the few who have actually seen it Victor. Glad to hear you enjoyed it also. The chemistry between the lead was a major plus point. Two class acts. Have seen so many trailers for this over the past year but this is the first review I’ve read. I’ll give it a go at some point, it’ll make a nice change I think. Nice write-up.